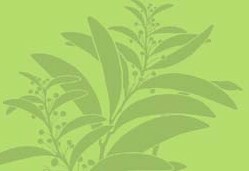 Description: Annual, biennial or perennial herbs and shrubs. Leaves alternate or rarely opposite, simple or compound; lamina often large and highly dissected; petiole often broadened and sheathing at base, rarely with stipules. Inflorescence terminal or axillary, sometimes leaf-opposed, usually compound, or sometimes a simple umbel or head or reduced to 1 or a few flowers; umbels usually with bracts (involucre) and umbellules with bracteoles (involucel) at their bases. Flowers actinomorphic, 5-merous, bisexual or unisexual and the plants monoecious, polygamous or rarely dioecious; floral parts epigynous. Sepals 5 and small or absent. Petals 5, valvate or somewhat imbricate in bud. Stamens 5; anthers 2-locular, introrse, dehiscing by longitudinal slits. Carpels rarely 1, usually 2 joined to form a 2-locular inferior ovary; styles 2, free, swollen at base to form a nectariferous disk (stylopodium); ovules pendent, 1 per loculus. Fruit dry, separating at maturity from the central axis (carpophore) into 2 indehiscent mericarps; mericarps often flattened laterally or dorsally and with 5 conspicuous or inconspicuous longitudinal ribs and often secondary ribs and furrows between them, the surface smooth, ornamented or sometimes hairy; seeds with endosperm, embryo minute. Distribution and occurrence: World: >400 genera, c. 3780 species, cosmopolitan but mainly temperate regions. Australia: 41 genera, c. 110 species, all States. Inflorescences in Apiaceae. 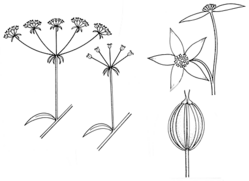 A, heads with sessile flowers and enlarged involucral bracts; B, simple umbel; C, compound umbel.